We all enjoyed reading your comments. Keep your grand kids! I’ll put the recipe on soon!!! Thanks for eating with us. Thank you for the comments. It is SO NICE to be appreciated and understood! We hope to keep you coming back! Good morning Carolyn. So glad you enjoyed your lunch. Both recipes are on the blog. The salad recipe is also in our cookbook. We love happy customers. Love your sweet potato soup! More, please. Enjoyed the quinoa arugula salad, caprese styled tomatoes, lentil chorizo soup, lemon curd and almond cookies last night. Oh, and can’t forget the warm spinach and cheese dip! This little piggie cried “yum yum yum” all the way home! Welcome to the blog. It’s nice to cook for an appreciative audience. Also the cookies that are half dipped in chocolate. Thanks for writing. I thought the recipe for Lentil and Chorizo was on the blog. I will make sure that gets on there. The cookies are listed under Almond Cookies in the “Sweets” section. There is also a recipe for a chocolate ganache that works well for dipping. Thank you for dining with us. I am a “picky eater” and everything I’ve eaten at High’s Cafe is the BEST! Thank you for your talent! 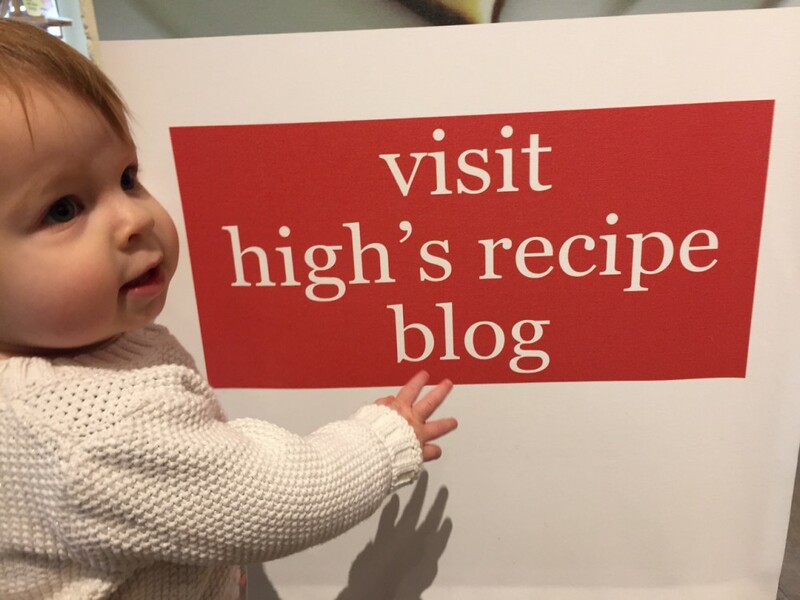 Would love to receive recipes via email. Just sign up online at the site highmadefood.com under the follow tag. Welcome! Thank you for the comments. SO PLEASED you had a nice meal. Yes, avocado toast in on blog. The radishes were a last minute addition and not on the recipe. HIGH TIMES! Love Brent’s generosity in sharing his excellent recipes with all of us. He is a creative chef without being too “out there” for home cooks. Thanks Brent. You are loved and appreciated. Thank you April. Years of support and love have been appreciated on this end. Would love to be included in emails. Just add your email to the follow bar and submit. I have been on a hiatus for a few. Hope to be back blogging soon. Thank you for the comments. I loved San Diego. A good friend from college has just been appointed General Director of San Diego Opera. He moved there from New York. He is very excited to live in that paradise! I cannot sign you up for the blog. Just add your email address to the follow box and click. I have been on vacation, but am back now with more recipes on the way. Go to the follow botton on the blog, enter your email address and hit submit. Favorite hill country lunch spot!! ALL look wonderful…let the cooking begin! Love, love, love High’s!!!!! My mother in law (Lisa) made the go green salad last night and it was to DIE for!!! Yes – I would think this message should get followers pouring in left and right. We’re making the Go Green Salad tonight (sans chicken) with fried shrimp. Can’t wait. Thanks for all the great recipes. Credit to you. Big bump in followers! Glad you guys liked go green. Good one this week too! Can’t say enough about the delicious food at High’s Cafe. Everything is so fresh and pleasing to the palate! 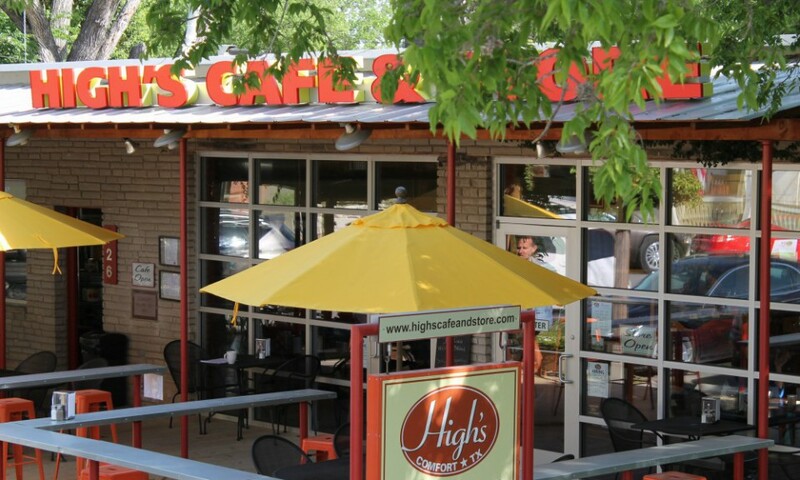 We stumbled upon High’s in Comfort several years ago while visiting the Texas Hill Country and now it is always on our “to do” list when we visit the area! Thank you for the compliment. Our goal is fresh and flavorful. Enjoy the blog. Now you can have a piece of High’s at home!